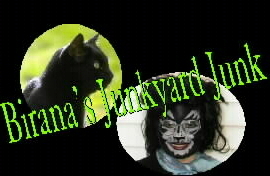 Birana's Jellicle Directory My original site! Pictures of my Birana costume! Don't go here! Heehee... I know a lot of sites have something with that title, but mine's a little...different. Finish the Quote! *Updated November 4! * A game that I made up... should turn out pretty funny! My Awards! *Updated October 8! * Yeehaw! This CATS Webring site owned by the Jellicle Cat known as Birana. CATS is copyright RUG and T. S. Eliot and Andrew Lloyd Webber and a whole bunch of people like that. I'm just a fan, this site is not intended to make money. And that's it for the copyright stuff, I'm not too good with that. This weird little thing with the green numbers was added on October 8, since I got sick of the other one not working.